“Haenyeo”(해녀). This is the word to refer those female divers who works especially under the sea in Korea. They gather seaweed, abalone, octopus, clams, sea urchin and other sea products. This word has meaning something special melting in their life beyond description itself as just a kind of job. In recent time, we are able to see them in Jeju Island (제주도) only, far away one hour by airplane from the capital Seoul in Korea. The teenage diving girl is catching abalone. I didn’t expect big volume of museum for unique female diver. 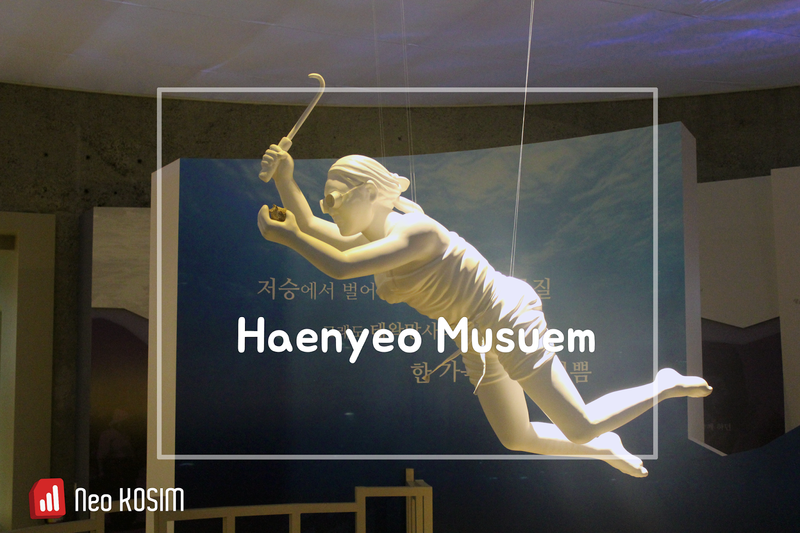 This museum is located neighboring the small cozy village by the sea. When I grew up, I saw them across the nation wide. But the number of them had decreased little by little because it is very hard job to work under the sea. For this reason, now we are just only able to see them in this island within Korea. The main reason why it remains in this island only is because of the special condition of island and poor environment for life. I surely wanted to visit this small space. When I entered this museum, symbolic artifact featuring of female divers greeted me. After ticketing, staff guided me to see the video about female divers story on the right side of the information desk. Although it was just only 10 minutes documentary image, it was enough for me to get much more strong impression about them than I expected. There were female divers through the whole country of Korea till the 1960s. They couldn’t be found out in main land recent time anymore. Jeju Island(제주도) was the most activated area in this country since long time ago. They had to lay specialty to the King and central government during all the former dynasty because this island has been rich in the marine products and it had boasted the best in quality when comparing with other sea fields. In the beginning, men undertook the duty. As time went by, many numbers of men ran away into to the land because they couldn’t tolerate the hard condition in nature and intensity of hard work. From long time ago, this reason resulted in the number of female is more than the number of men, in unique population composition rate in this island. As the results, ladies had managed to take over the economic duty for family as well as preparing of principal products instead of their husband. The social position of them as a significant role to manage in all parts of their society is quite different with other area in this country. Furthermore, land was so infertile (this island was composed by the several volcanic activities) that they could not cultivate diverse agricultural products and always suffered from food shortage. All that people could do was just to cultivate small amount of grain and agricultural products and to gather the food resources from the sea. Their greatness is just not only in the tenacious hold on life and strong pioneer spirit but also in their wonderful working skills under the sea. They usually started to learn how to swim at the age of seven or eight, skilled up their diving abilities as they grow and became a full-scale woman diver member at the age seventeen to eighteen. They can dive in general fifteen to twenty feet (6 meters) in depth without oxygen tank, sometimes to seventy feet (21 meters) and for over one minute even to three minutes. When they work, they do without using any underwater diving equipment like oxygen tank in unique. It couldn’t be done without invincible spirit of great courage, long experiences and accumulated technology about sea. It was the job beyond job for their life. The sound (Sumbisori) like whistling to get their breath back when they come out surface of the sea shows that how amazing their unique and excellent diving technique as well as astonishing scientific discovery as the result of gaining through their body are. It is close to the sounds made by whale and able to provide fresh air into their body in short seconds with this way. With the changing years, there has been changed in their tools and clothes but they do still the same skill of old way when they gather the sea products. The seafood taken by them became to be sold expensive because it is regarded as valued nature products. As they earned the money much more than before, they send their daughters to the land to educate well and get more comfort life. So, ironically, it became one of the key reasons of fall-of the number of them sharply. Who can dare blame their opinion? For the reasons of hard working condition, sharp decrease of sea products and it is true that these female divers might be disappeared in couples of decades and be left just as the name of old traditional unique culture in this island. The view overlooking the blue sea from the observation rest area on third floor was enough for me to feel deep impression with wild wind and waves they meet every day. How clean and brilliant sky it was! Those ladies who was born as the daughter of sea, learnt the swimming and diving before knowing what the sea shall imply to their coming life, faced harsh reality and managed to duties of life in assertive attitude. Sincerely, this museum must be small but deep meaningful place dedicate to their great trace of life. Yet the labor song what embrace their plight life seems like to remain in my ears. *Update>> They are listed on Intangible Cultural heritage of Humanity by UNESCO on NOV2016. Operation; 9 AM to 5 PM except on first and third Monday every month and some special holiday. For more details please refer to their official web site. Are you planning to travel Korea? Check out NeoKOSIM solutions with the best unlimited data service let you share your travel experience and stay in touch with friends and family till back home. Stay surf without hassle! I ve been to Jeju a few times but I never knew about this museum. Interesting! !